I can remember watching those boring films of pollution and littering in my elementary school classroom. Exhaust belching automobiles and industrial smoke stacks, overflowing landfills, littered landscapes, and finally… polluted waterways with dying wildlife. Those images are forever etched into my brain. Yet nearly 50 years later, we’re still fighting to keep our environment clean. Why? Even more so, what are the consequences of illegal dumping and littering, and who can stop it? As a child, I didn’t quite get the importance of watching those films – other than to give me an opportunity for a morning nap. But as I’ve grown older, I’ve learned to appreciate the beautiful environment and wildlife that surrounds us. After a half a century has gone by I’ve often wondered why we, as an intelligent society, still throw trash on the ground and illegally dump hazardous waste in the dead of the night. One of biggest reasons is due to a lack of personal ownership. We simply don’t feel responsible if litter or illegal dumping is done in areas of public or commercial property. ‘If I don’t own it, it’s not my problem’ seems to be the mentality. Or, ‘someone else gets paid to clean it up.’ The more people see this as an acceptable behavior, the more it becomes a contagious and habitual behavior. With an ever-growing populace comes an increased cost for waste disposal. While many do the right thing, inevitably there will be irresponsible individuals and commercial businesses that would rather cut corners than to legally dispose of their waste – even if our environment health is the one suffering the price. Utilizing options like residential and construction roll off dumpster rentals allow for a fast and affordable waste disposal. As the need for convenient waste disposal methods increase, so does a lack of alternatives. This trifecta includes using renewable resources, providing ample recycle centers and advocating for proper recycling behaviors. What are the Effects of Illegal Dumping and Littering? Who can Stop Illegal Dumping and Littering? Most people these days are aware of the federally operated Environmental Protection Agency – the EPA. But surprisingly enough, very few realize individual states have a state-run regulatory program in place responsible for waste management and the proper disposal of hazardous waste. In fact, locally operated state environmental protection agencies are authorized under the EPA’s Resource Conservation and Recovery Act (RCRA) to regulate, maintain and enforce laws relevant to illegal dumping, littering and maintaining documentation of said waste. The absence of public understanding and modifying irresponsible thought patterns and behaviors remains a challenge. While the legal bodies of government are there to regulate and discipline litterbugs and waste dumpers, we as a society have the ultimate responsibly to ‘do the right thing.’ We each have the freedom to make responsible choices. 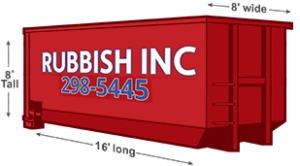 Contact Rubbish INC Dumpster Rental for a proper waste removal alternative!